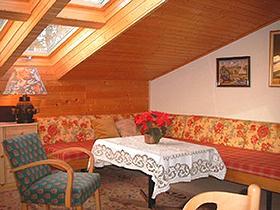 Apartment Wienerwald, a cosy and quiet 2-room apartment, 50 m� for 2 - 5 people, facing the garden with a wonderful park view. There are 2 beds in the living/ dining room. Further furnishings include: 1 bedroom with 1 double and 1 single bed. The bathroom is with shower, WC. The small kitchen is with fridge, dishwasher, coffee machine, radio and SAT-TV. The downtown is 10 km away and can easily be reached via bus and subway (bus stop 160 meters). There are supermarkets and restaurants at 400 m, outdoor and indoor swimming pools and tennis courts (2 km - 3 km). You�ll find wonderful hiking paths in the woods. There is a free parking in front of the house. No minimum stay. Arrival day is flexible.